“Flying out to LA,” she posted on her Instagram account with the photo of her donning sunglasses and a broad grin. Hakimi and two victims were co-workers at Pacific Union International, a San Francisco Bay Area real estate firm. One of them, 42-year-old Lara Shepherd, was married to the plane’s 53-year-old pilot, Scott Shepherd. Another was 29-year-old Nasim Ghanadan, who saw Hakimi as a mentor in the real estate industry, Ghanadan’s brother said. Hakimi’s 32-year-old son, Navid Hakimi, was also a passenger on the trip. 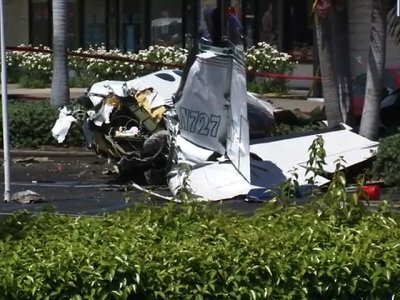 The pilot declared an emergency but didn’t state the nature of his problem before crashing about a mile (1.6 kilometers) from John Wayne Airport, striking four parked cars, National Transportation Safety Board investigator Albert Nixon said Monday. Nixon didn’t know how much time elapsed between the call and the crash.